This certificate recognizes that the building is healthy, energy and resource-efficient. As part of BFHP’s commitment to the Berkeley community and environmental sustainability, Terrie Light hired Viviana Lahrs as facilities manager. Viviana came to BFHP with a background in architecture and green buildings, real estate and a passion for green building. She has spearheaded work to measure and upgrade the environmental impact of the North County Women’s Center. Viviana Lahrs poses with our Greenpoint Rating certificate and $8000 award check. North County Women’s Center comprises a 12 to 24 month residential communal housing and living skills program for women and children experiencing homelessness; North County provides over 11,000 nights of shelter per year. When we pay attention to our programs’ environmental impact, we are able to commit more resources to individuals we wish to serve. Viviana was in the middle of installing a solar hot water system on top of the North County Women’s Center roof whenStopwaste.org took note of the project. Stopwaste informed Viviana of a grant available jointly from Alameda County and Stopwaste: Stopwaste would provide reimbursements for the costs of any environmentally friendly capital improvements if the North County Women’s Center could achieve a high enough rating on Greenpoint Rating Standards. 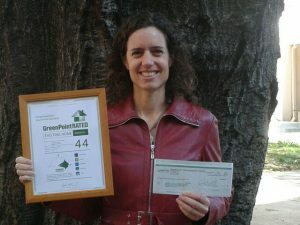 Stopwaste.org gave North County Women’s Center a green environmental rating of 44 points out of 50. NCWS was evaluated based on five different categories: energy efficiency, water conservation, indoor air quality, resource conservation, and community. “We’ll achieve fifty points this year, actually, when we finish replacing the kitchen floors with naturally-based marmoleum,” adds Viviana. As part of the community score, Viviana travelled to NCWS house meetings and spoke with clients and staff about composting, recycling, and energy efficiency. Viviana’s work goes hand in hand with efforts to educate clients about health and well-being. This education is part of BFHP’s holistic approach to homelessness: supporting an individual as a whole on their journey from homelessness to independence. I was first invited by Stopwaste.org to learn about the “Energy Upgrade California Alameda County Multi-family program”, back in March 2011. As part of the Stopwaste.org Alameda county program we were assigned a consultant team (Heschong Mahone Group, Inc. to begin the initial technical assistance on the project with the initiation of a preliminary GreenPoint Rated checklist…. Further free technical and design assistance was provided to BFHP through theEnergy Upgrade CA program, which helped BFHP navigate the GreenPoint rated process and identify opportunities for other green/energy efficient building upgrades. In April 2011 we were awarded ME2 funding by the COB (We applied for ME2 in July 2010, this provided initial funds for an energy audit which led to the recommendation and completion of Solar Thermal Project.). ME2 was a grant created by COB from Obama’s 2011 Federal Stimulus Package to create more energy efficiency projects. ME2 along with CDBG (Community Development Block Grant) and private donations, funded the Solar Thermal Project at NCWC. The Solar Thermal System installation was complete in February 2012.